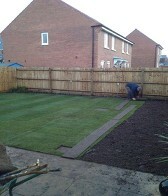 We offer years of experience in creating new gardens and landscaping for new build developments. These include single property and estates, and commercial and residential properties. We have worked with major property development clients and delivered high-quality landscaping on time and in budget. With this background, we can offer you creative ideas, professional service and cost-effective work that will delight you. We have worked with some of the UK's leading residential housing developers. They rely on us to create attractive and cost-effective gardens and landscapes to complement their new developments. We will be pleased to discuss your requirements new build landscaping requirements and present a fully costed quotation which will represent excellent value for money.